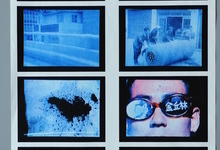 The Meaning of 1/24 Second is Korea's first experimental film and was filmed in 1969. This 16mm film in color and black and white is composed of hundreds of inconsistent scenes. Taking the basic structure of the film, which consists of 24 frames per second, The Meaning of 1/24 Second expresses the steep reality faced by modern man, and the sense of alienation that comes from uncontrollable speed. The video file that remained only in digital format since it went missing in 2001 was restored to 16mm film for screening for his retrospective exhibition , which has been held at Seoul Museum of Art, Republic of Korea in 2013, thus providing an opportunity to look back on its meaning.